CUSTOM PET PORTRAITS (HAND-PAINTED) 3X3 Inches. ) 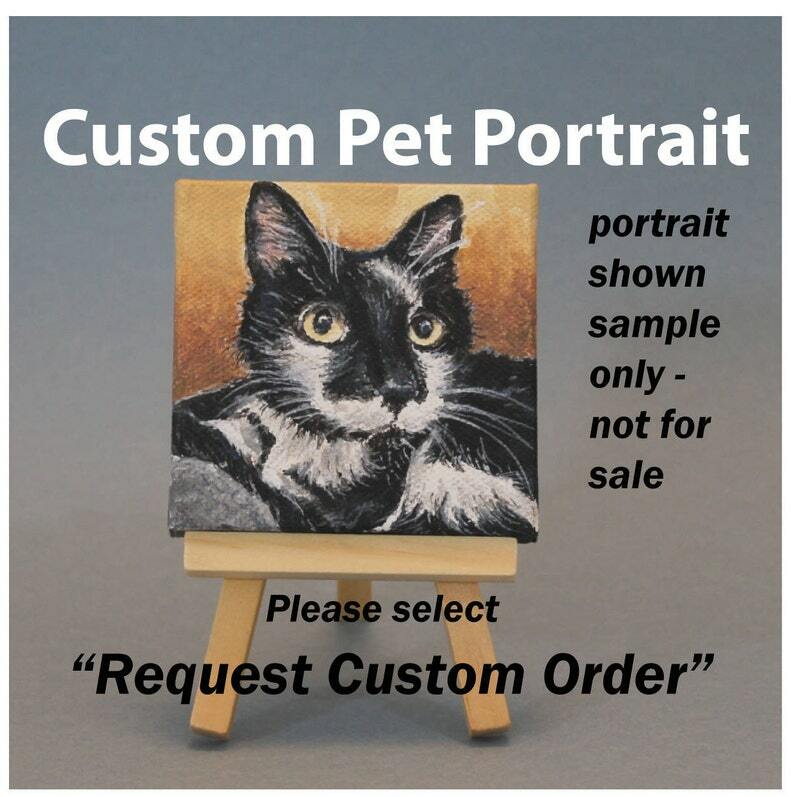 PLEASE SELECT "REQUEST CUSTOM ORDER"
Acrylic paintings made from the jpegs you send me. NOTE: Listing images shown are SAMPLES ONLY and are NOT FOR SALE. Samples are shown simply to give you an idea of what a typical portrait might look like. Image is carried onto sides of small canvas. A small wooden easel is included. Paintings are varnished several times for protection. My work is 100% GUARANTEED-- if you don't like the painting, send it back for a complete refund. FREE SHIPPING IN U.S.!! Contact me with any questions or inquiries about other sizes and I will respond promptly. Thank you! Read on for direction on ordering! (2) SEND IMAGES TO LAKEFXSTUDIO [!at] GMAIL.COM: Send good resolution images to assure better detail --at least the best that you have); send multiple images if it helps to describe your pet). I will generate a pose from your images and allow you to preview it before I start painting. ANY SPECIES IS ACCEPTED....dogs, cats, birds, snakes, etc.!! If you have a specific detail or appearance that would make this more personal to you, please let me know and I will include that in the preview stage. Naturally, any delayed exchange of communication (approval) can potentially delay my starting to paint, depending on the promptness of the emails or phone call if needed. Otherwise, it takes me approximately a week to complete and then ship your portrait via US postal mail which can take 3-5 days. So figure delivery almost 2 weeks from acceptance. See more of my work on my website: www.johnvassallo-fineartist.com Commissions are accepted. Car Art Digital Illustration of 1952 Henry J 10"X14"
I love the pet portrait John did of our Gracie who we sent over the Bridge in June. It's a gift for my husband. I communicated with John my thoughts and asked if he could have it finished in time for Christmas. John graciously opened up his pet portrait option and immediately worked on the portrait. He communicated with me every step of the process. Well, the portrait came and it is fabulous!! It looks just like our Gracie. My husband will love it!! Thank you John for understanding how important this gift was and for your beautiful rendition of our furbaby. I highly recommend John and suggest a glance at his FB page too!! Beautiful and detailed small artwork. Looks very expensive. Very happy with my purchase! 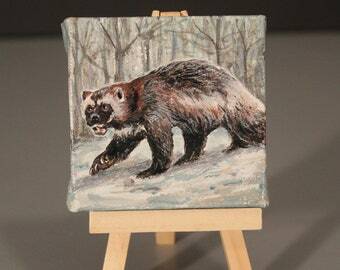 My Lake FX Studio Etsy shop is set up to receive Pay Pal, and Direct Check Out payments accepting major credit cards. I adhere to the guidelines and terms of these methods and strive to maintain customer satisfaction. My goal is to provide maximum security for all parties involved. 100% Satisfaction Guarantee: This means that if you are not satisfied for any reason, return the art work to me and I will refund your entire purchase price and shipping. Lake FX Studio wants to retain your relationship and honors returns with full refunds (including postage) provided that artwork or other products are returned in good condition. If such items were received in damaged condition, I will provide a refund with the return of those items. Furthermore, if you are dissatisfied for any reason, you need only return the item for a full refund. Please: All refund requests must be submitted within 30 days of receipt of the items being returned. As I discover more efficient ways of providing shipping and delivery in a cost-efficient and safe manner, I will pass along those savings and efficiencies to my customers. Typically, I will send things out quickly using the U.S. Postal service which means it gets to its destination within its normal operating timeline. I honor special requests for expedited delivery if they are willing to accept the added costs. Otherwise, I use the simplest method of shipping and use recycled packaging materials when possible. As return customers you will find that I strive to build lasting relationships and offer special incentives and discounts to friends of Lake FX Studio. My personal goal is to exceed your expectations and to bring not only satisfaction, but also truly inspirational art. Your referrals earn similar rewards of special offers or other perks. Collectible Car Illustration in Digital Print Format of 1930 Ford Sedan 10"X14"